With the automatic tuning feature the local clock becomes significantly more accurate. Since I also added a persistence for the correction factors it is natural to assume that the clock will be more accurate right from the start. After experimenting and testing for more than two months I now know that the temperature influences at room temperature are low enough to achieve a precision of better than 3 ppm at startup. I even tried this under the roof where temperature swings are larger than in the rest of the house. With other words: the assumption that the clock is accurate to about 100 ppm at startup can be replaced with the assumption that the clock is accurate to 5 ppm or better. Since the timeconstants for the 100 ppm clock precision already containw some safety margin this implies that I can increase the time constants for a tuned clock by a factor of 10. The impact is that the initial decoder stage may collect 10 times the data and thus improve signal noise ratio accordingly. It follows that the clock will stay locked under even more adverse conditions. Also the threshhold time for the unlocked to free transition can be increased 10 times. Thus recovery from signal fading will be much better than before. So how is this done in practice? The crucial pieces of code are as follows. // ensure that reading of data can not be interrupted!! As you can see, as soon as the precision is 8 Hz (or 0.5 ppm) or if it gets a frequency adjustment during setup it will call DCF77_Clock_Controller::on_tuned_clock(). As the name indicates this should be considered something like a “event handler”. The implementation dispatches the call as follows. The two setters just increase the time constants for the DCF77_Demodulator and the DCF77_Local_Clock Module. // will be called once crystal is tuned to better than 1 ppm. The impact is tremendous. Do you remember the Phase Detection Experiment? N controls the bin size of the decoder for the phase detection. A larger value of N implies that it will tolerate significantly more noise. The noise tolerance is increased to a level where you can disconnect the receiver antenna for more than half an hour without losing the lock. The increase of the max_unlocked_seconds to 30000 will in addition enable accelerated recapture of the phase lock for the first 30000 seconds (more than 8 hours) after losing a lock. Although this is very cool there is one issue with this approach that kept bugging me. Some of my readers (most notably from the UK) noticed that they have difficulties with the auto tune. This is because they are not only dealing with notice but with significant fading. Often they will have only some hours of DCF77 reception per day. The noise is easily filtered by my clock but the periods are usually to short to finish the auto tuning. So these guys with the weakest signals and the poorest SNR will not get this improved noise tolerance. Obviously there is a need for automatic tuning that can tolerate signal loss during the tuning process. My solution is a new and significantly improved auto tuning algorithm. Below is the meat of the new implementation. // other seconds thus calibration will run in second 5. // from its nominal frequency. // work because we are in an interrupt and will not be interrupted. // We restore the constant immediately after the check. // in an unqualified state and thus the leap second information may be wrong. // Leap seconds will mess up our frequency computations. // Handling them properly would be slightly more complicated. // stop calibration for leap seconds and do nothing else. This code basically operates in 2*2 or 4 different states. It may be either in state “qualified” or “unqualified”. This refers to the sync state of the clock. 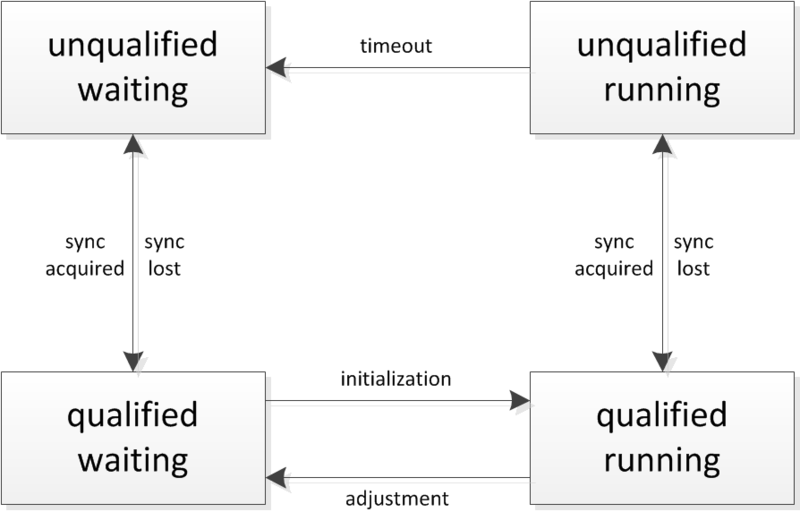 If the clock syncs the state will shift to qualified (lower part of the diagram below) and if sync is lost it will shift to unqualified (upper part of the diagram). The other two states are “running” and “waiting”. The transistions are connected as follows. The important part are of course the transitions between running and waiting. These transitions are computed once per minute at the dedicated “calibration second tick”. There is nothing special about this tick, however due to the large time constants it suffices to compute this once per minute. It also implies that it becomes unnecessary to compute the seconds offsets because they are always 0 centiseconds (mod 6000 and thus also mod 60000). While running it will count centiseconds (derived from the 1 kHz ticks) which are derived from the crystal clock. It will also count minutes. The minute count is tricky. While the clock is in sync the minutes are derived from the DCF77 signal. In addition the 1 Hz ticks are derived from the DCF77 phase lock. Thus if the clock is “qualified running” the minutes mod 10 plus the seconds and the centiseconds mod 60000 must match. Notice that this is not the “elapsed_minutes” which are also derived from the 1 kHz ticks. I am talking about the DCF77 minutes and seconds here. You may also wonder why I work with centiseconds mod 60000 and minutes. The point is that I want to keep everything in 16 bit integers. This does not only conserve memory it also avoids costly 32 bit integer division operations. The downside is that there must be no “unqualified running” period with more than 30000 centiseconds (or 300 seconds) deviation. A quick computation in the head indicated that even at 1000 ppm frequency error this will happen only after 3 000 000 centiseconds hence the ~5000 minutes maximum calibration time will not make this overflow. Very picky readers will also notice that my integer computations are not 100% accurate. Well, this is integer math but it does not really matter anyway. The point is that clock errors are not equally spaced anyway. So there is always an uncertainity in the measurements anyway. As it turns out the uncertainity in the measurements is significantly larger than the rounding errors of the integer math. So how good does it perform now? Well, below there are some log files which I got from Ian Castleton. (WordPress does not allow me to upload .txt.gz files. Thus I renamed the suffix to “key”. Please save the .key files as .txt.gz files and unpack them.) For the interpretation of the log files see the Swiss Army Debug Helper. Ian lives in London. As you can see from the logs the signal quality is crappy. There is a *lot* of fading. And when there is no fading there is still considerable background noise. As you can see from the 2014 10 09 log it took almost two hours before the clock started to tune. Especially in the 2014 10 11 log you can see how poor the signal really is. Anyway the clock locked to it and tuned successfully to better than 0.5 ppm. Some long term tests are still runnning. But so far it looks as it works perfectly well. Any hint on why the persistent tuning has been removed (github)? It was not worth the effort. I caused more issues than it solved. The point is that if the clock is running continously it does not help. If the clock is NOT running continously there is no guarantee that the operational conditions at the next startup are anywhere near what was persisted. In particular it could happen for some very poor crystals, that the feature made it impossible to acquire any lock at all. So the persistence introduce complexity and more code to the library but did not benefit everyone. It also implied that it might interfere with other uses of the EEPROM. The theoretical gain in noise resilience during startup is marginal in practice. Thus I decided to remove this feature.